Get a TASTE- for FREE! Table Tasty Giveaway! Salt-free friends and flavor seekers! 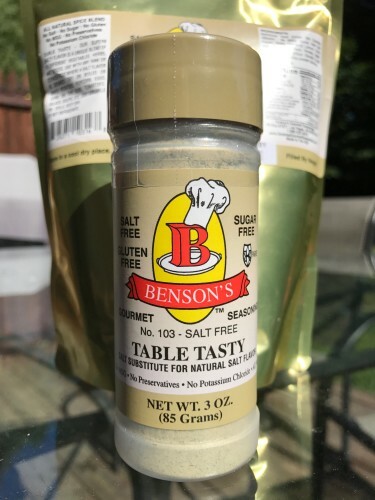 I’ve written about many salt-free seasonings over the years, all of them delicious in their own right, but the one I’ve talked about most is Benson’s Table Tasty. This miracle blend by Benson’s Gourmet Seasonings is simply the closest thing I’ve found to salty taste with ZERO salt and sodium. Debbie Benson, the amazing woman behind the brand, wrote to tell me that they have improved their packaging – adding CLEAR backs to the 1 and 2 lb re-sealable bags – making it even easier to know when it’s time to re-up! SO. Where does that leave us? Well. Whether you’re like me and simply can’t get enough of the salty taste of Benson’s Table Tasty – or – you’ve never had the pleasure of sprinkling this lil marvel on popcorn, potatoes, and so much more, you’re in LUCK. Because I have a 3 oz. bottle + a FULL POUND BAG of Table Tasty to give away! To enter to win this taste-tastic duo, simply leave a comment below letting me know you want the Benson’s! This contest is open to everyone, everywhere, regardless of political affiliation. Since I’m still processing peaches (sigh..) I will leave this open through the weekend, announcing the lucky random winner first thing Monday morn (September 18, 2017). As always, I will not add your name to any list, contact you to sponsor my kids’ school, or any other such nonsense, I promise (former girls scout’s honor). Hope you are all very well. It’s beautiful here in Portland, Maine and I’m off to peel peaches! WOO. 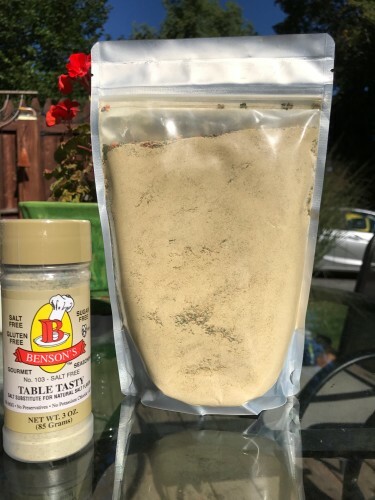 This entry was posted in Promotional Giveaway and tagged Benson's Gourmet Salt Free Seasonings, Benson's Table Tasty. Bookmark the permalink. 73 Responses to Get a TASTE- for FREE! Table Tasty Giveaway! Who wouldn’t want to try a tasty seasoning without salt/sodium?! This girl does!!! Would love to try this “saltless” salt. Oh how I would LOVE to try this out! Love to try these and add to the low sodium quest! Sounds like I should be trying this one out. I am still looking for that good old salty taste with the dreaded salt! Let’s see the drawing is the day before my 75th birthday (see how long I have been looking). This would make a super birthday present. Oh wow! Would I love this !! Ménière’s disease has me salt free and love to try this !!! Yummy !! Hoping something comes my way ! Luck of the Irish ☘️! I would love to try this seasoning. The other brands just dont have that salt taste to them. This salt-free product would contribute to my well being & my taste buds. Life without flavor is boring. Looking for new alternatives, would love to give it a go. Thanks for the chance to try it. I would love to try Table Tasty! My daily sodium intake is around 1000-1500mg. I am always on the lookout for yummy salt substitutes. Would love to try this! Count me in! I want the Benson’s! We love your recipes! 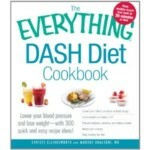 Your website is the best one I have found for flavorful low sodium meals! Would absolutely LOVE to try this. Oh yeah! Salt free seasoning! Wow! How can I get a sample? What else is in it? Yes. Please. I would LOVE to try this!!! Pick me, pick me! I want! Thanks in advance! Awesome to know it comes in bags too! even more awesome is that I’m in Portland every July – so hope I can bring some home next time…..what a vaca souvenir that would be ! Love Bensons!! Have them all, except running out! Would love to win this! I would love to try Table Tasty! I’ve heard it’s a great substitute. Would love to win. Have not tried these seasonings before but have heard good things about them! I love Table Tasty! Am enjoying some of Benson’s other seasonings too. Any opportunity to get some is blessing for me. This sounds great! Would love to try it! I have never tried this or heard of it before. I have just started my low sodium journey. I would LOVE to try it! Count me in! I’ve been relying on Mrs. Dash for far too long. My husband has really struggled going low-sodium and could use anything that tasted like salt! I would love to win Table Tasty. I have to cut my salt because of Congestive heart failure and would love to try Table Tasty to help me do so! I miss salt so much!! I would love to have a substitute to tickle my tastebuds…sigh…. I miss salt so much!!! I would love to have a substitute that tastes like salt…sigh…..
I’ve gone dairy free, why not salt free too? I had to go salt-free for health reasons and have found it incredibly difficult. I’d love to try this “salt-free” salt seasoning!! I wanna be entered I use this on every thing I eat. Great in Corn in the Cob!! Have tried many no salt seasonings but never tried this one. Winning and trying it for free would be great! My ten-year-old daughter and I both monitor our sodium intake. She was diagnosed with Crohn’s disease in April and her medication causes excessive sodium/water retention. 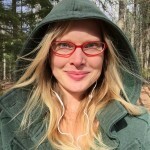 I was diagnosed with stage 3 CKD in July. It has been a tough year with lots of changes due to our new health needs. This would be an amazing addition to our new menu plans! We would love to try it. dinners out. I think I have told just about everyone I know about this product. Excited to be in the random pick! I’ve never tried this product but would love to. Thanks for the chance, Christi. My husband and I continue to enjoy sharing your meals at our table! Having the flavor of salt without the ill effects of the sodium would be fantastic. Oh Yeah! I want the Benson’s! Would love to try, some foods just don’t taste good without the salt flavor. Fingers crossed, hope I win! I’m new to this low sodium lifestyle. Would LOVE to try this! Sign me up! I would love to try some salt-free yumminess!! My husband is recovering from full cardiac arrest and now has been diagnosed with CHF. This in turn has turn our whole world upside down. He is now on a low sodium and we are struggling to find flavor!!! We’d love to try this product!!!! I am also thrilled to find your site and try many of your recipes!!! Thank you! Just learned my husband has to go lo-sodium to save his kidneys–huge learning curve and struggle to find things he can eat. This sounds like a godsend as is your website. This one is a must have in my books! Can’t wait to try it. Well put me on the list…salt-less love here I come! yes, I would definitely like to give this a try! Yes would absolutely love to try this!! My husband and I are on a no-salt lifestyle and it is hard to find spices that don’t affect his stomach. He has such a sensitive system and would love to have something that tastes like salt…with no sodium and yet full of yummy awesomeness!! I would love to try this! 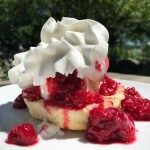 I love your website and have used so many of the recipes – working on a menu and grocery list now and your website is the first place I go for ideas! I would like to try Benson’s, please! I am having to cook salt-free for my 90 year old mom and it doesn’t always go over well. Would love to give this a try. I would love to receive Benson’s Table Tasty. Your website has been a life-saver! From diagnose to hopefully a transplant soon, you have helped me re-think my cooking & baking and still maintain flavorful & delicious food for the family. 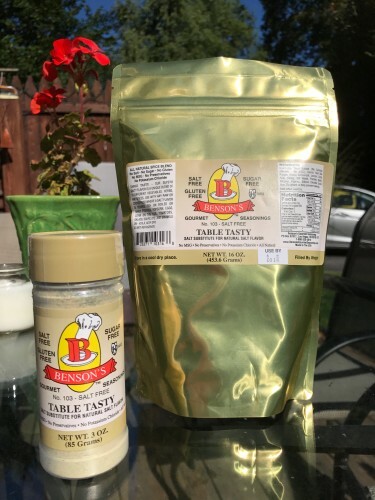 The lucky random winner of the Benson’s Table Tasty Giveaway is…. JAN EACHES! Congrats, Jan! I’ll be sending you an email ASAP. Many thanks everyone for entering. I’m truly sorry I don’t have a treat for you all. I went ahead and ordered a couple bottles on Saturday. Used it last night on rice & beans. It was amazing. Wife couldn’t believe there was no salt in it. I would love to try their products. I’ve heard great things but have never had the opportunity to try them. Thanks.